N.G.P. 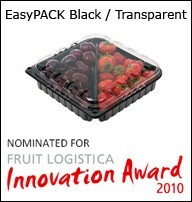 Plastic S.A. will be attending 2010 Fruit Logistica in Berlin February 3-5. The new product is made with horizontal or vertical partition foil, it is suitable for strawberries, grapes, baby tomatoes, cherries, etc. 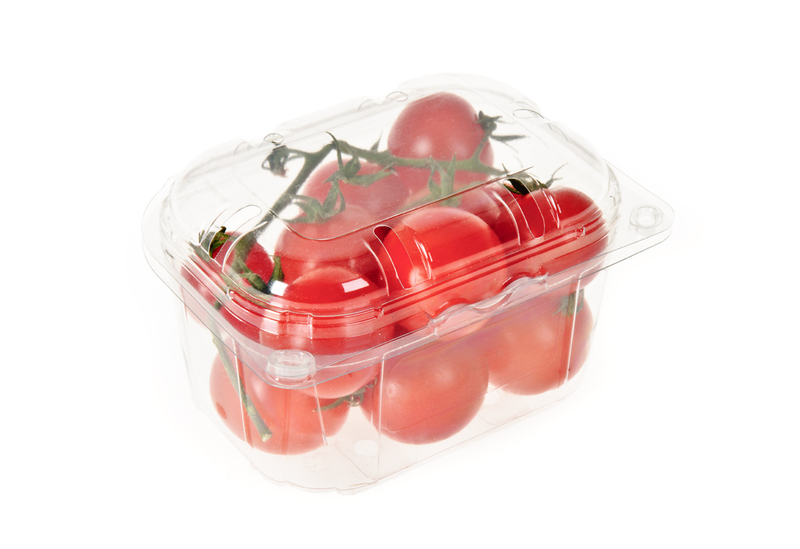 The new container is offered in various colors; it is suitable for strawberries, grapes, baby tomatoes, cherries. It may be delivered with inside bubblepad. The installation of the new line for thermoforming E-PET containers in various colors intended to fruit and vegetable packing has been concluded. The test container production is successfully progressing and the normal container production is expected to commence in April 2009. That was the most successful exhibition in years, with 2280 participants from 80 countries and over 50,000 professionals who visited the site from 125 countries. .Our Company (one of the 20 participating Greek Companies) through its exceptionally dynamic presence, had the opportunity to promote, amongst others, the innovative and unique throughout Europe bicolor containers, fitted with EASYPACK LINE cover, which have become a smash in the fruit and vegetable market. Machinery installation that commenced in January 2009 in the extension of NGP PLASTIC Plant in Corinth is now in progress according to schedule. It is expected to conclude in April. 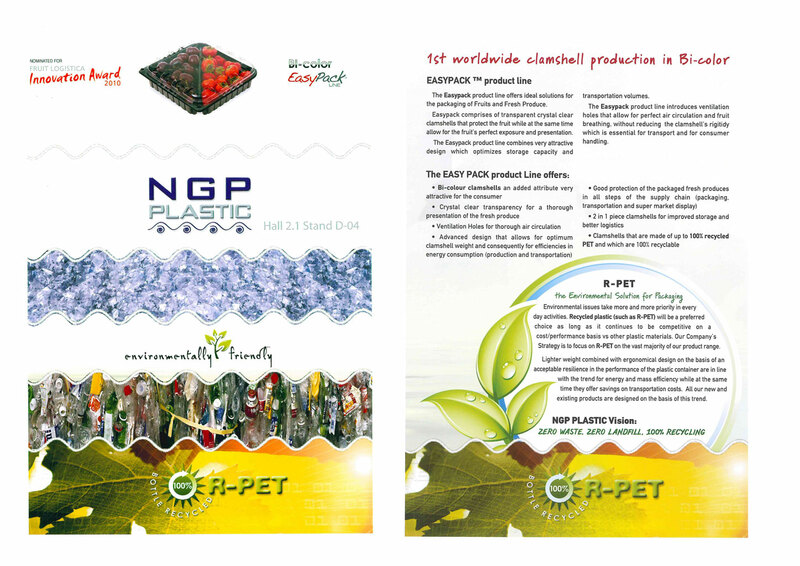 NGP shall be the first company in Greece which shall produce PET, PP multilayered foils with barrier and laminating possibility, with PE, PE-barrier for the food industry. The new multilayer extrusion line for multilayer foil production consists of 5 extruders converging into one head. 7-layer foil may be produced with laminating possibility. The bicolor fruit-and-vegetable container EASYPACK LINE (container with attached cover) produced by NGP PLASTIC in various colors and forms is unique in Europe. 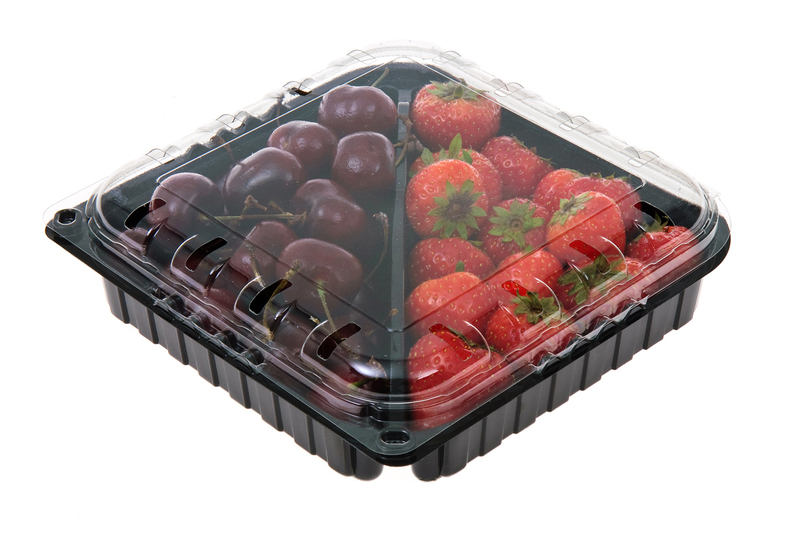 This innovative packing enhances the image of products contained, especially those of intense colors, like baby tomatoes, strawberries, cherries, etc. 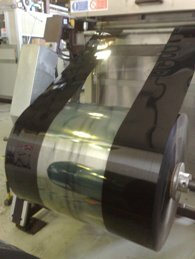 Having invested on new machinery, NGP PLASTIC now produces bicolor foil for food industry. That innovation gives the company international leading position for the production of an integrated fruit and vegetable packing product (container with attached cover) in two colors. 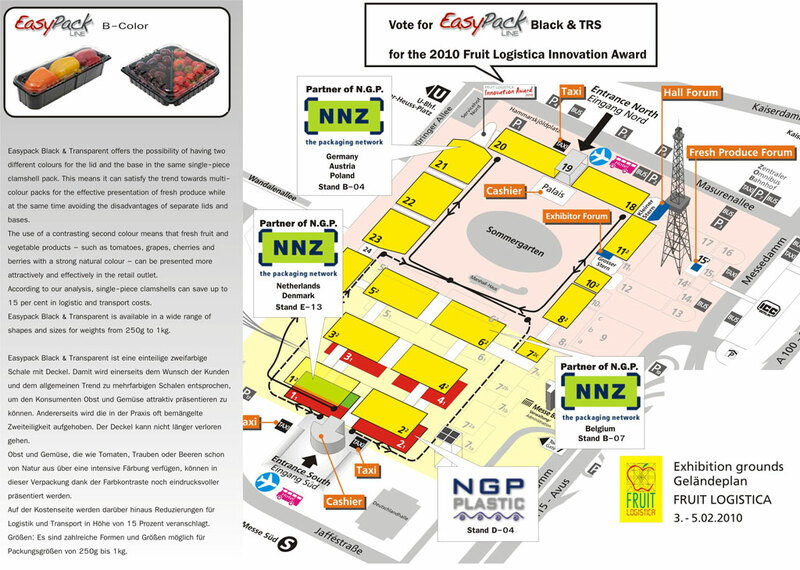 NGP PLASTIC will take part in FRUIT LOGISTICA 2009 in Berlin from 4 to 6 February in Hall 6.2, stand B-01. 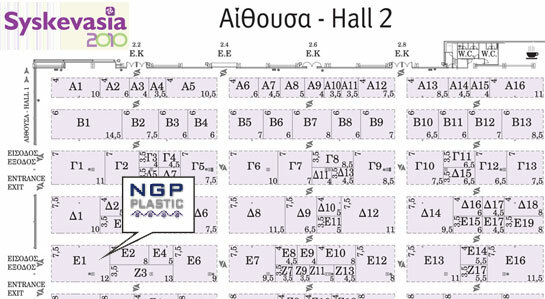 The company BGP PLASTIC ABEE of the NGP GROUP is again participating in the 11th "SYSKEVASIA 2008" exhibition this year. “Innovative products manufactured from state of the art production process implementation” describes perfect NGP PLASTIC new production plant in Corinth owned by Mr. Nikos Papadakis. NGP PLASTIC Production plant modern premises in Corinth are equipped with the latest generation technology PET, PP, PLA multilayer, dual-color foil extrusion lines, thermoforming lines and a variety of further production phase special applications such as foil laminating in-line with extrusion, foil slitting & rewinding conversion lines, container 4-color printing lines, pluriball applicators, label & laser marking systems (barcode label, code no marking) etc. NGP PLASTIC increased level of constant production innovation and technical know-how allow great flexibility in satisfying the most demanding customer needs. Usual customized applications being served are traceability (barcode labels or codification laser marking for customers that keep records of statistical process control), pluriball application, 4-color printing on lid, customized logo embossing, special colors or dual-color effect, thin film lamination (usually for welding the container with PE film for air sealing) etc. The covered area of the production plant is 3.000 sqm within an area of 11.000 sqm in total. Thirty employees are working in the production and offices, specialized in the research, development and implementation of innovative fruit packaging product ideas, pioneers in the market evolution and ready to give solutions to customized needs of our business partners. The following Quality Management Systems are under development and implementation in NGP PLASTIC according to the respective international standards: Operation Management EN ISO 9001:2000, Enviromental Management EN ISO 14001:2004, Health & Safety ELOT 1801/OHSAS 18001, Food Packaging Safety Management EN ISO 22000:2005 (HACCP) and Certification BRC/IoP Packaging Standard. 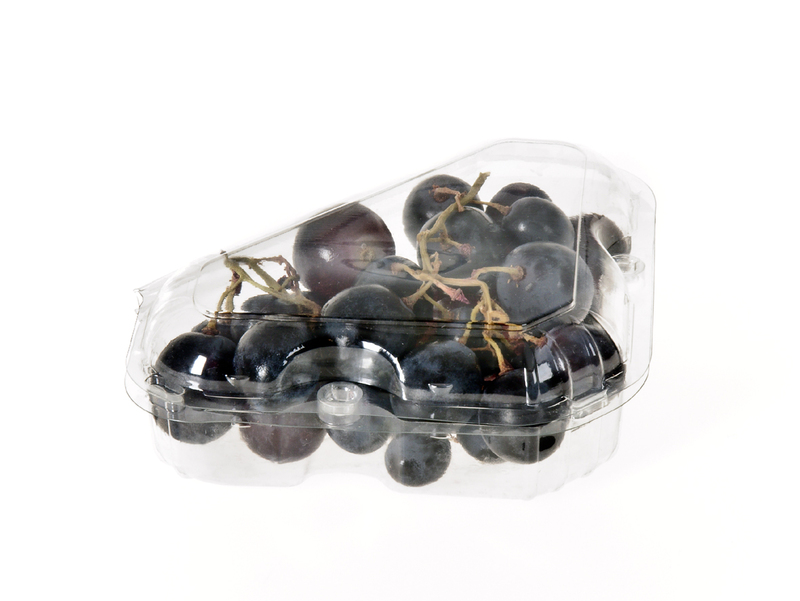 The unique design of EasyPack line lid, bottom and side wall reinforcements allow a greater number of side openings on the lid and therefore improve the air circulation inside the packaging. The superior transparency of PET foil and the significantly more flat surface of side walls and lid that Easypack line products offer among all others in the market, contribute to the best exhibition of the packaged fruit or vegetable. Moreover, they are completely ecological, water-clear but also available as half transparent – half opaque and are unique in their category due to their special design (under European Patent registration). 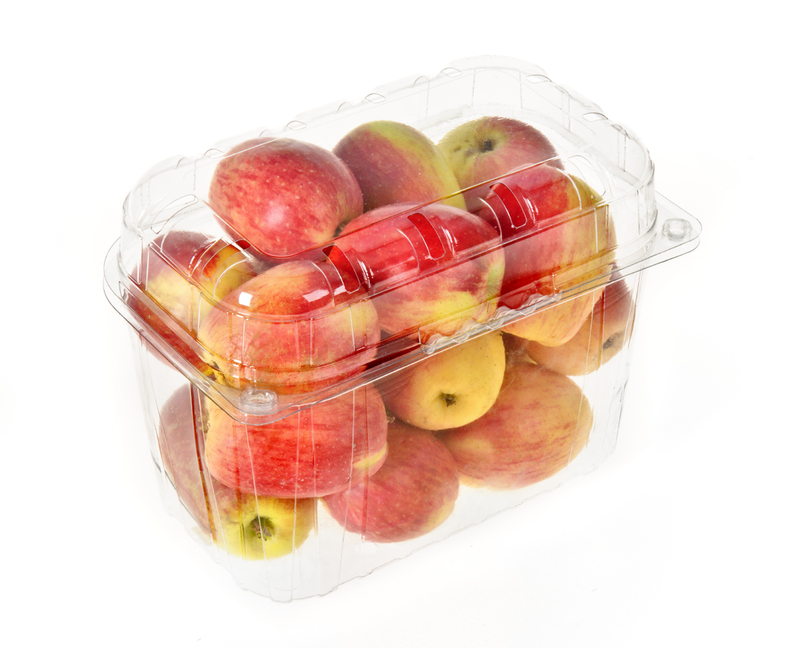 The EasyPack line system allows increased air flow inside the packaging, thus guaranteeing improved packaged product conservation. Thanks to the special design, air inflow is assured even when these packaging units are stacked and therefore greater results in efficient cooling, drainage and condensation reduction are achieved. 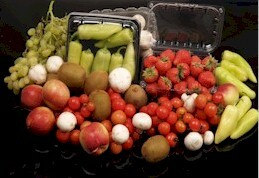 Thus fruit and vegetables maintain their best quality characteristics for a longer period. A connecting net of five different area reinforcements functions in EasyPack line products resulting in unbeatable mechanical strengths of this packaging to stable or periodical vertical and horizontal impact : multiple hard cylindrical segments on the lid are connected with peripheral solid blocks of the bottom, through side wall vertical reinforcements on the four corners, in combination with the specially designed stabilization means connecting the lid with the basket. EasyPack line micro-packaging offers packaging standardization, practical stacking, permits automatization on packaging lines and most of all optimize transportation and stocking costs. Thanks to EasyPack line products consistency, the lid is very easily applied on the basket. In addition, in EasyPack products lid and basket lock tightly reassuring no intermediate contact of the packaged product from the producer to the final consumer. Both above characteristics also help eliminate the danger of product damage. The disposal of products made from biodegradable polymers, such as PLA, creates no negative impact to the environment. The full chain break down of these polymers to simple hydrocarbons and water takes place in a few months.